I walk a minimum of 5 kms. everyday, I do this on my way back from work. I love the sights and smells that a walk on a busy road offers. I walk past the Amman koil in K K Nagar every evening, the temple, shops, busy traffic of vehicles and pedestrians offer rich tactile, olfactory, visual and auditory stimulus. The rains have made the soil squishy and my shoes breathe through the ooze of the wet soil. The line of garland and flower shop is a visual and olfactory treat. I halt to take in the heady smell of roses, jasmines and rajnigandha. I stopped here one of the evenings to make this sketch. 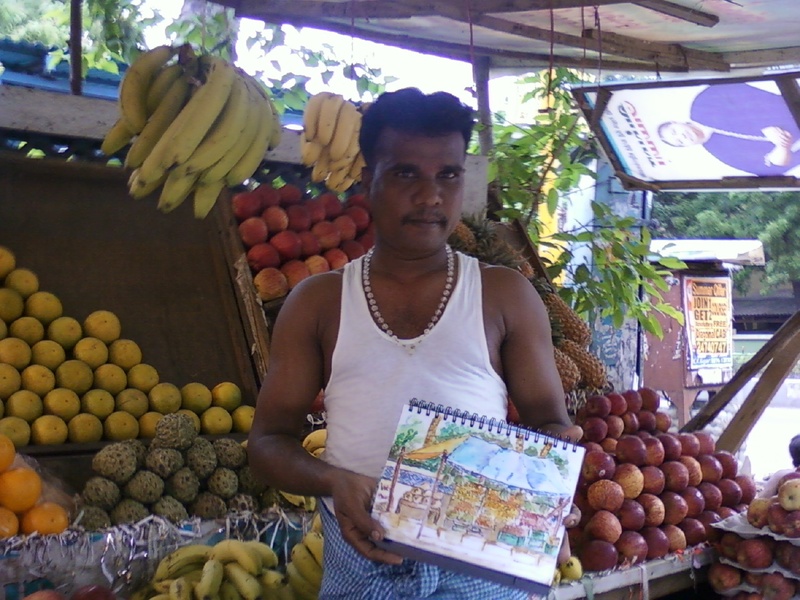 Bhoobalan graciously offered me a stool to sit and sketch his fruit shop. He went about his business of polishing the apples, speaking on the cell phone, removing fruits from the plastic crate. When I was done I showed him my sketch which I was embarassed about because it was just squiggles, I had scribbled some notes of details. 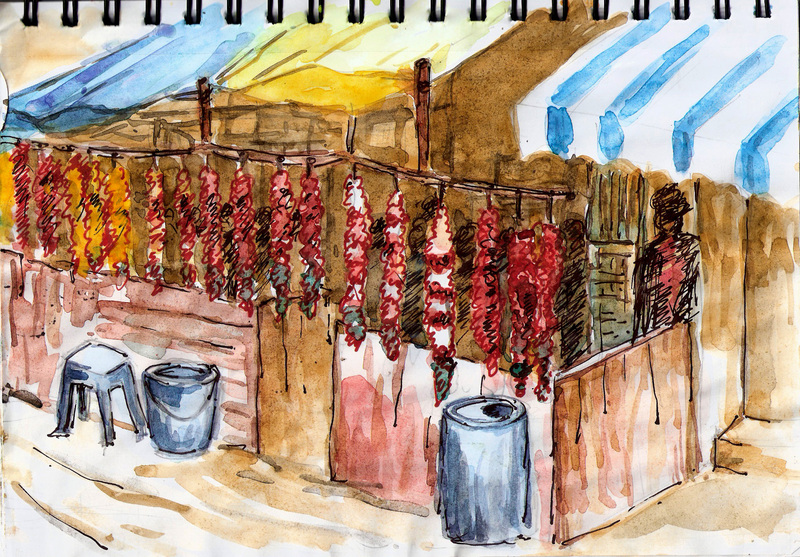 I doubt if he saw his shop in the sketch, but he still remained polite talking to me about his business. He said that he earlier sold watermelons and tender coconuts at several places and on handcarts before opening this shop on the busy junction in Ashok Nagar. In his shop apples, oranges bananas, papayas and tender coconuts are neatly arranged. 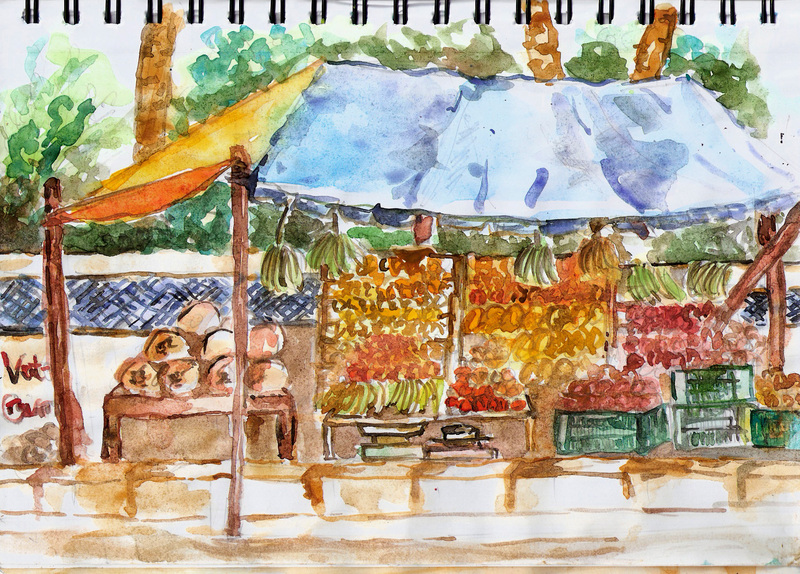 Colourful canopies protect his shop from the sun and the rain. Chennai is experiencing some gusts of unseasonal rains and on that dreary grey afternoon the blue, orange canopy brought me some cheer. I completed my painting that evening and took it to his shop the next day. I asked him if I could take a photograph of him holding my painting. Now I visit him very often and show him my paintings of other places. I have found a new friend in Bhoobalan. 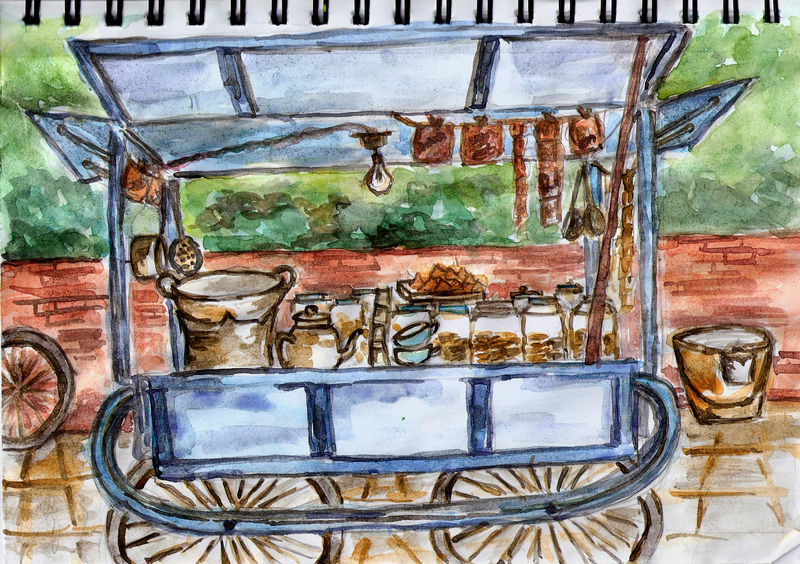 This tea stall on the tree-covered Greenways road is a favourite haunt for auto drivers. The smell of kadak chai and hot samosas fill the air. The drivers take respite between savari with masala chai and crisp samosa, and they are in no hurry to resume duty. I do not blame them. I drew this when I waited for a driver to finish his tea to give me a ride back home from work.